This page is part of a feature about the first records sold at Woolworth's. The Little Wonder label proved to be a smash hit when it was introduced in North America in 1915. At the peak the 5 & 10¢ sold upwards of half a million discs a week. 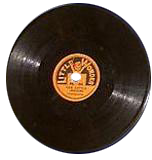 Little Wonder records caused a sensation in North American 5 & 10¢ stores between 1915 and 1923. They were single-sided and ran for just over a minute. Because of their small size they play at 80rpm. 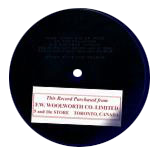 Early discs measured 5", later ones 5½". These discs had no sleeves and sold for 10¢. Many different styles of music were included. Some, like this one, show the shortcomings of the original mechanical recording process, which struggles with the quiet instrumental.